Bay Food Brokerage was founded under the belief that a food brokerage firm that concentrated fully on the perishable side of the industry would succeed and do very well. In 1992, Mark Woolever and Cammie Chatterton saw the brokerage industry shifting from the small independent food broker to the large national grocery food broker. Mark at the time was the Director of Meat at Affiliated of Florida and was frustrated by the large broker sales person trying to sell meat items and not knowing what they were representing. Cammie was a perishable salesperson at the manufacture level who believed that a representative who concentrated on the perishable industry was more knowledgeable about their products. Mark and Cammie began to compare notes and quickly saw that their expertise and knowledge in the perishable industry was the right combination to develop a focused approach to perishable sales and support. Bay Food Brokerage is now 100% owned by Cammie Chatterton. Our company has grown into a brokerage firm that expands over 7 states with employees located in key areas thru out the entire region. 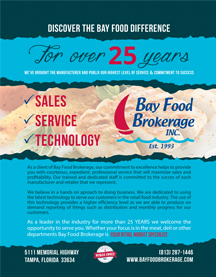 Bay Food Brokerage believes in reinvesting in their people and the company. They believe that the sales job is not only done at the corporate level but it is done at the store level. This is why they have put much of their investment into the retail sales person at store level. Bay Food Brokerage still has the same core values and beliefs that the company was founded on: hard work, determination and a drive to be the best brokerage firm possible. These beliefs are what drives them all daily and keeps the focus on a job well done. Many manufactures and customers have teamed with this winning combination to expand and grow their business into the future. In 2018 Bay Food Brokerage expanded to the Virginia market making it the seventh southeast state covered. In 2015 Bay Food Brokerage founded the Grocery Division and hired Dave Smith, Manager of Grocery Division along with Danny Swanick, Director of Business Development. In December 2015 Bay Food Brokerage announced the retirement of founding partner Mark Woolever and acknowledged his 23 years of dedication to the company. We purchased a new office building which more than doubled the space for the Bay Food Brokerage Headquarters. We celebrated our 20th Anniversary with further expansion through out the SE United States. The next generation of management joined our company with Chris Chatterton becoming the Director of Operations. Bay Food Brokerage was chosen by Publix to be a preferred broker with Publix on the Publix ISE Program. Bay Food shows growth in sales of triple digits over the past decade. Amount of employees has grown evenly with sales to show unparalleled expansion. Expansion to new larger office facilities and added more office assistants. We expanded to Georgia with retail representatives. Expanded office facilities by hiring our current headquarter manager Susan Jamieson. Opened territory in the Miami markets for full retail representation.